As part of learning how to make better photographs with my Nikon D300s Digital Single Lens Reflex (DSLR) camera I started changing the camera's settings. After shooting Autum leaves and having a print made the leaves looked more brown than bright red. Just into it and there's a lot of good info. This is required to work with the Nikon .NEF raw files. The Nikon D300s supports 14 bits per color channel when RAW (.NEF) files are used and that means every photo has fantastic dynamic range, not stacking or other stuff needed. A side benefit is that you also have a lot of control of the color balance. This is where ACR is. Move ACR to a temporary location. Now run the Camera_Raw_5_7_updater (or the version ending .dmg if you have a Mac). When the updater has finished it places the new ACR in the above file location. NOTE: if the old version of ACR is in the above folder the updater will not replace it! To confirm open CS4 and under EDIT\Preferences\Camera Raw - you will see the version is now 5.7. A workaround may to be open the file using some other application, like Microsoft Paint, and then save it in some Photoshop compatible file format with a new name. Now hopefully the file can be opened. The purpose of this hardware device is to calibrate your monitor, nothing more. This is a USB device that measures the room light (assume brightenss and color). This is done with the probe in it's desktop cradle and with the LEDs facing you. There is also an option for automatic monitor adjustement for room lighting and in the preferences selection (right click the Pantone icon in the system tray) you can choose how often to make that correction. It seems to default to once every minute, but I set it for a 10 minute interval. 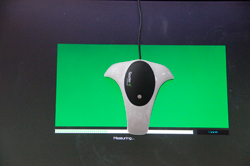 It also measures and adjusts the monitor (select LCD or CRT) color temperature and brightenss. 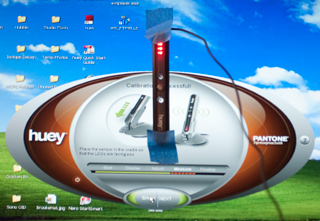 This requires using the small suction cups on the probe and sticking it to the monitor. 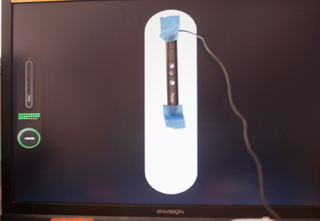 In my case it would fall off the monitor, so I used Blue masking tape to hole it. When finished you can click on Before or After correction to see the difference, and it's very noticable. What's correct is based on which application you select. For example Gaming, pre press, web browsing, etc. The Stock "huey" has no serial number and there's very little information about how it works or what it's doing. There's an on line upgrade to "huey PRO" that supports multiple monitors, different gamma values and has a few other features. I'm not aware if there's a "monitor profile" or not. Do not know if it changed the monitor settings or changed settings in Windows XP. Not sure what applications will see the new settings or if everything will see the settings. A few years ago the Huey quit working. 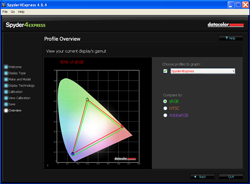 April 2015 saw an ad for the Datacolor - Spyder4 and got their basic version (Express). 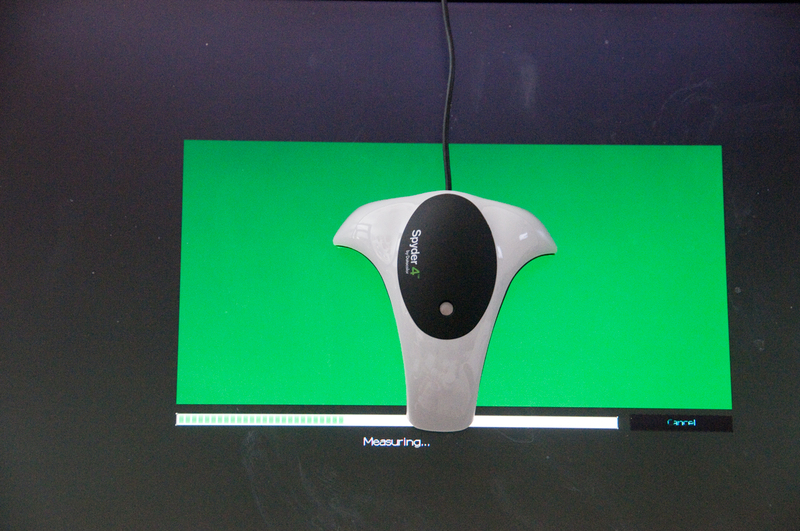 The Spyder products are for measuring and adjusting color monitors. The Spyder5 is the current model, hence the sale price on the Spyder4. For me the key thing is controlling the details in shadows. This can best be done when the monitor is calibrated. that hangs on the back of the monitor. Fig 2 Calibrated test images after calibration. 1) Are there better monitors that will display most or all of the AdobeRGB space? 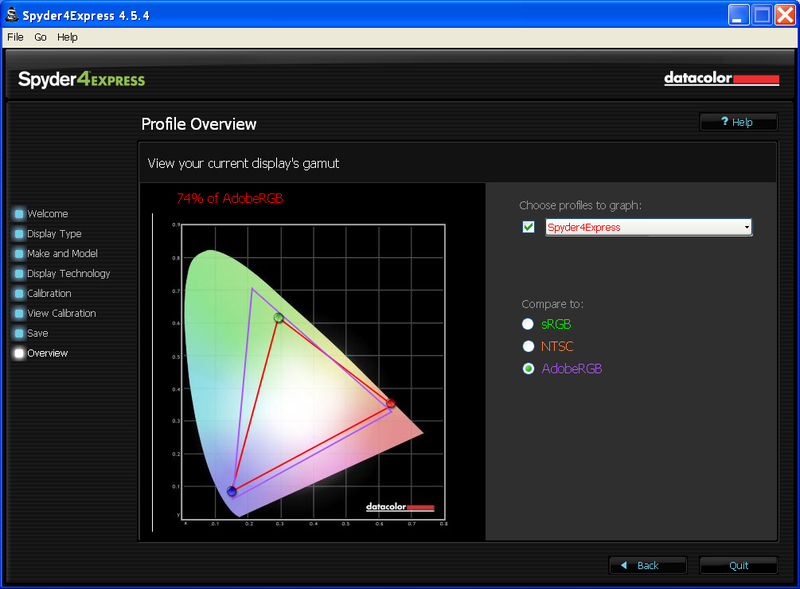 2) Does the Nikon D300s camera setting for sRGB or AdobeRGB make any difference with .NEF files are used. 3) How to get the color space coverage values for various monitors? Since you can specify either sRGB or AdobeRGB color spaces the White Balance setting matters. In the case of the Autumn leaves photo the camera choose 4100 K which is not the correct value. This may be part of the problem in getting a color print that has the correct colors for the leaves. Maybe the Adobe RGB color space needed to be changed to sRGB prior to being sent to Costco. Costco by default Auto Corrects your color balance. I tried a sample print with that turned off and it made no difference. Changed size to 20x30 and DPI to 150, from 16 to 8-bits/channel submitted as on line .tif file. Set 5500 K in ACR, changed size to 12x18 at 150 DPI, 8-bits/channel submitted as on line .tif file. The Photoshop Color editing page (Edit \ Color Settings) was changed to: North American Prepress 2 (was Custom) which sets the RGB working space to AdobeRGB (not sRGB). The Photoshop Color editing page (Edit \ Color Settings) was changed to:North America General Purpose 2 which sets the RGB working space to sRGB IEC1966-2.1. The NEF file was imported and no changes made in ACR where the color temp now shows as 5500k. Going to the folder where the NEF file is stored and deleting the file Fall2011f22.xmp then opening the NEF again. Now the temperature shows up as 4100K. Making no changes in ACR and opening in PS CS4. At the bottom left of the image on the border there's an icon for "unmanaged file". 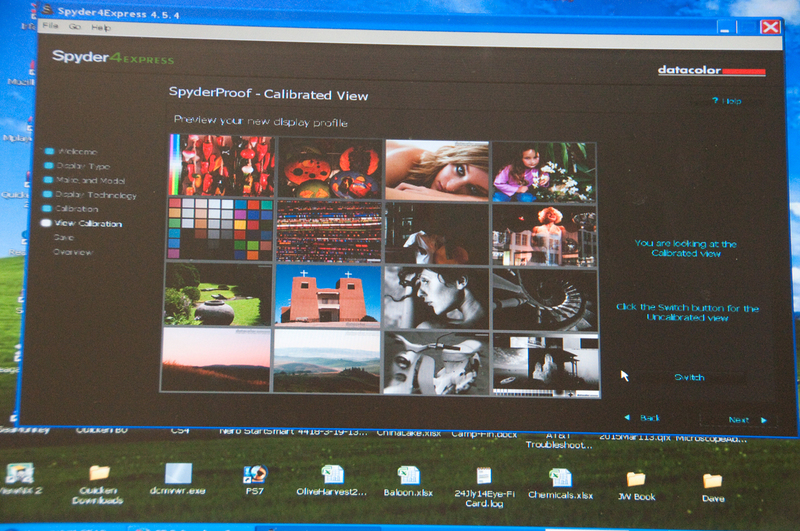 The "Save As" dialog box has a check mark next to ICC Profile: ProPhoto. How to get that changed? Resized to 8x12" and 72 DPI and saved as a .tuf file with the ICC Profile unchecked. Shut down CS4 and restarted. No change in ACR, open image in CS4, change image size to 8x12 (leave at 300 dpi). But when trying to save as .tiff the ICC Profile has not changed, it's still checked and at ProPhoto. Note: At the bottom of ACR that's what appears to be a blue colored link, but it's really how you change some of the parameters including the color space. What a stupid change in the human interface from all the other input methods. Starting with the original .NEF file, opened in ACR and selected "Daylight Color Balance" at the top. At the bottom changed the blue link from PhotoPro color space to AdobeRGB color space. 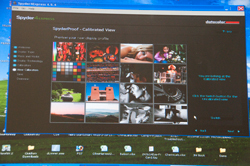 In CS4 changed image size to 8x12" (kept 300 dpi). Starting with the origional .NEF file, opened in ACR and selected "Daylight Color Balance" at the top. At the bottom changed the blue link from PhotoPro color space to sRGB color space. Based on the human eye and includes all the possible colors that can be seen with the eye. The Weston Model 594 Photronic Cell may be an important part of making this measurement since it was designed to respond to different colors of light and output their brightenss in the same way a human eye would report the brightenss of a colored light. All of the non CIE color spaces are a subset of this eye response color space. If three primary colors are used to define a color space (like those below) then the possible colors that are in that color space can be found by looking at all the colors in the CIE space that are touched or enclosed by straight lines connecting the three colors used. If more than three colors are used then the area enclosed (and the points touched by) straight lines can be in that color space. So by using, say for example, 8 different colors, all located on the perimeter of the CIE space, you could recreate all visible colors. The L*a*b* (* to emphasize that it's Luminance plus 'a' and 'b' color dimensions) color space includes all perceivable colors which means that its gamut exceeds those of the RGB and CMYK color models. One of the most important attributes of the L*a*b*-model is the device independency. This means that the colors are defined independent of their nature of creation or the device they are displayed on. It's well inside the CIE space for all the colors and is far short of being on the perimeter of the CIE space anywhere. "developed by Adobe Systems in 1998. It was designed to encompass most of the colors achievable on CMYK color printers, but by using RGB primary colors on a device such as the computer display. The Adobe RGB color space encompasses roughly 50% of the visible colors specified by the Lab color space, improving upon the gamut of the sRGB color space primarily in cyan-greens." But it's still totally inside the CIE color space and nowhere touching the perimeter. This appears to be the best choice in terms of getting an imporvement and getting prints made. Developed by Kodak for photographic output. 16 bits/color channel recommended. Uses 3 colors and the red seems to be at the CIE perimeter for red. The Blue and Green colors are OUTSIDE the CIE space and so saturated red, orange and yellow colors are included. But the Green, although outside the CIE space, does not include the CIE green peak and so the possible colors fall short in the greens and blues. "The CMYK color model (process color, four color) is a subtractive color model, used in color printing, and is also used to describe the printing process itself. CMYK refers to the four inks used in some color printing: cyan, magenta, yellow, and key (black)." Astronomers use this method to generate false color images of the heavens. There is a classical set of color filters that have been used, and there's a new set of Hubble filters that are more modern. By taking a series of photographs each of which is illuminated with a single color LED, where the focus is sharp for each color (eliminating problems with lens design), then the images are combined to form a color image. If the color of the illuminating light is known and hopefully on the edge of the CIE color space (Wiki) then all the colors enclosed by straight lines connecting the light source points can be rendered. It will take more than 3 colors of light to enclose the space, maybe as many as 8 different colors. But the resulting image should be very good. The Motion Picture people have tried this and found LEDs do not work. See Wiki Color rendering index. While studying printers found the Epson 4900 which can print up to 17" wide sheets or from a roll. BUT, none of the pre cut sheets of paper are in the 1.5:1 aspect ratio like all 35mm cameras and digital cameras. I've asked about third party papers to see if you can get: 8x12, 10x15, 12x18, 14x21, 16x24 or other papers in photographic aspect radios. Assumes your monitor is calibrated. Store info: Epson 7880 Poster Printer, Fujifilm Papers. Note: This lab uses our enhanced accuracy custom profiles. To get the Epson 7800 printer select Lustre only in a print size of 16x20 or 20x30. Using Printer Profiles with Digital Labs - has instructions on usng the printer profiles. View -> Proff Setup -> Custom gets you to the "Customize Proff Condition" Window where the printer profile is slected. Do NOT select Preserve RGB Numbers (you can click it to see how bad the image gets). Do select Simulate Black Ink and Simulate Paper Color and Preview. I tried all combinations of the 4 Costco profiles and the Rendering Intents and the closest one is shown below. Size the print for 300 dots per inch for the print size you want. It' not clear if you need the exact pixel count or exact size. The story goes that Canon was offering a package deal of this printer and a Canon DSLR camera but they didn't get enough takers so offered a different package deal where this printer and a couple of boxes of Canon brand color paper were combined for a total price (after mail back rebate) of $100 which I couldn't pass up. I have a box of 13" x 19" paper and some smaller sizes. A friend used some special cloth on a backing which is supposed to allow color printing on cloth and they remove the backing, but more than half the time it jammed. page created 29 Oct. 2011.